The Winter Solstice arrives on Saturday, marking a headlong plunge into winter. Looking at the past 42 years of data shows that almost the entirety of the Lower 48 has warmed over the season. Precipitation trends show more regional differences, though. 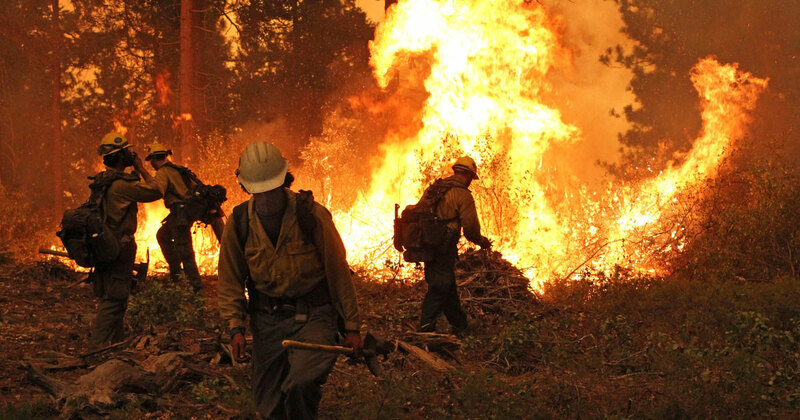 Climate change due to greenhouse gas emissions have in large part caused temperatures to increase by 1.5°F since 1895 in the U.S. Much of that increase has come since 1970, and different seasons are warming faster than others. Winters, which begin in the meteorological sense on December 1 and run through February, have warmed 0.61°F percade in the contiguous U.S. from 1970-2012. That's faster than the rate of 0.435°F of warming per decade experienced over the same period. Winter warming isn’t uniform, though. 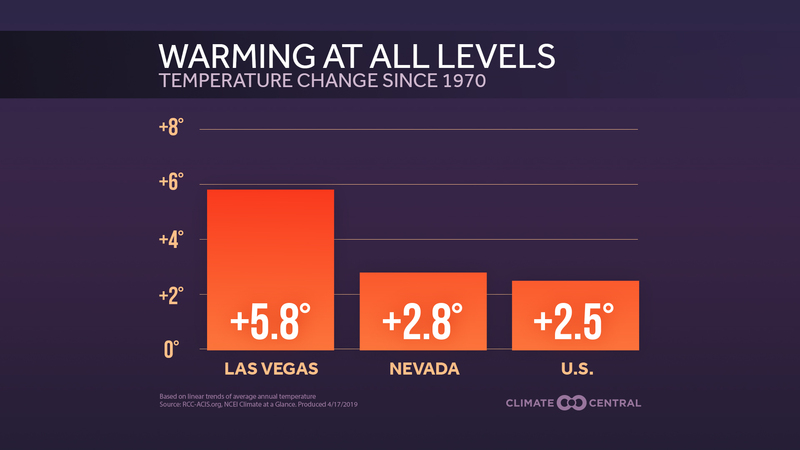 California and Nevada have only warmed at a rate of 0.17°F per decade over that time — the slowest winter warming region in the country — and the Southeast has gone up just 0.29°F per decade. 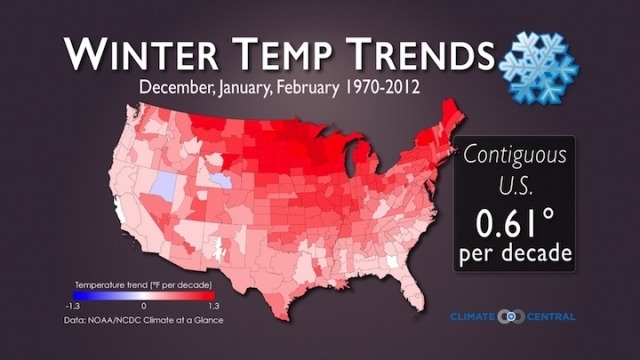 A map showing winter temperature trends in the U.S. from 1970-2012. However, the winter warming trends for both the Upper Midwest and the Northeast have been higher than the national average. The Upper Midwest is warming the fastest of any region at 1.12°F per decade and the Northeast comes in second at 0.78°F per decade. The Ohio Valley rounds out the top three, warming at 0.66°F per decade. Of the 344 climate divisions, which are used to divide the country into similar climate zones similar to counties, only two have seen a cooling trend over that period. Precipitation trends paint a more nuanced picture of change in the U.S. The biggest changes in winter precipitation trends since 1970 come from opposite corners of the country — the Southeast and the Northwest. 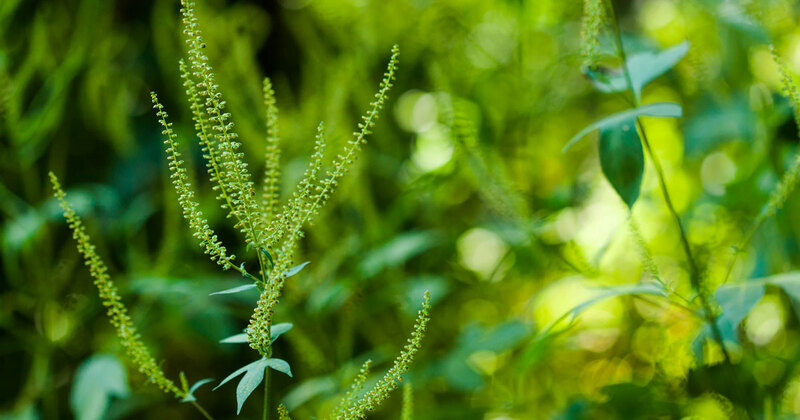 The Southeast has dried at a rate of 0.182” per decade, with Georgia and South Carolina showing the starkest drying trend. The Northwest is down 0.136” per decade, with the largest decreases along the immediate coast and the crest of the Cascade Mountains. Lighter snowpack in the Cascades is bad news for skiers, as well as the region’s hydropower generators, which account for 40 percent of the nation’s hydropower generation. The Northeast and the Northern Rockies round out the list of regions experiencing a decrease in winter precipitation, though the trends there are minimal compared to other areas. 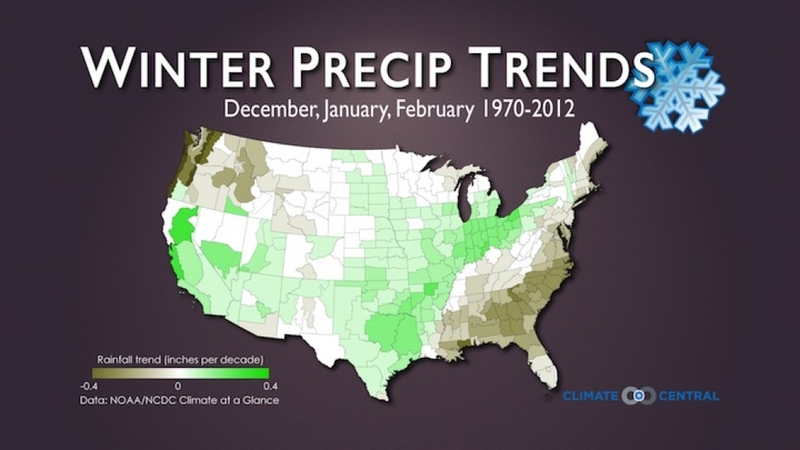 A map showing winter precipitation trends in the U.S. from 1970-2012. Meanwhile, a large chunk of land from California to Ohio has seen an uptick in winter precipitation since 1970. The largest regional increases are across the West at 0.081” per decade and the Ohio Valley at 0.067” per decade. Within those areas, northern California has had the biggest local increase, though Californians might have a hard time believing it this year as 2013 is on target to be one of the state’s driest years on record. Though the Southwest is getting drier annually, it bucks that trend in the winter. Since 1970, the Southwest has experienced a rise in winter precipitation at 0.037” per decade. A cold snap after Thanksgiving also set the U.S. on course to set more record lows than record highs for the first time in 20 years. Globally, a record-hot November has the planet on track for one of its top five warmest years on record, though. For winter as a whole, the Climate Prediction Center is forecasting increased odds of above normal temperatures and below normal precipitation for much of the southern half of the country. The Upper Midwest is more likely to be cooler than normal while the Northern Rockies have improved odds to see more snow than usual. Much of the country has an “equal chances” forecast, which means there's not strong signal favoring warm or cold conditions.